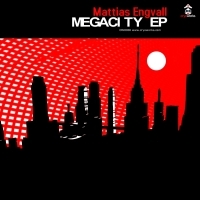 Mattias Engvall takes us on an introspective mini-ride of his vision of a sprawling megacity on this EP. The title track, immerses us in the ambient surroundings of modern earth and its audio-syncrasies. This deep and brooding track sets the stage for "feeling in monochrome", a downbeat minimalistic glitch-hop interlude that's sure to be a favorite. The EP finally slips into "faan" a bubbly bath of synthyness with an accompanying noise distortation that evokes the omnipresence of electromagnetic technology in the distant future.